On our first full day in Hanoi I had arranged a tour with HanoiKids Tour. 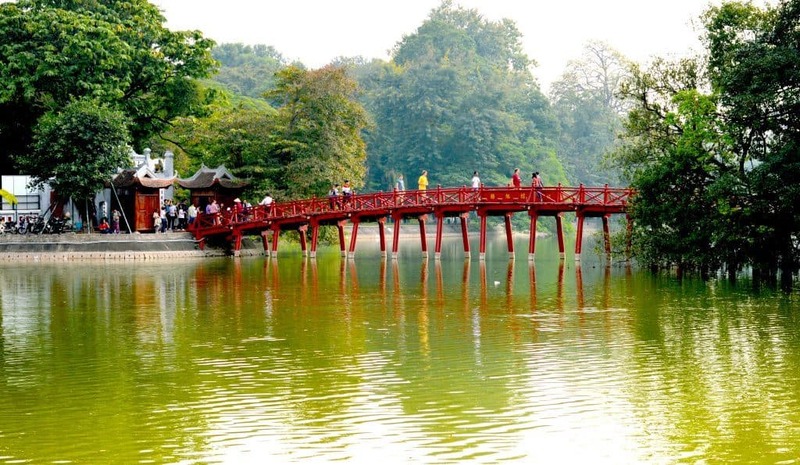 HanoiKids Tour is rated as the number 1 tour in Hanoi on TripAdviser. 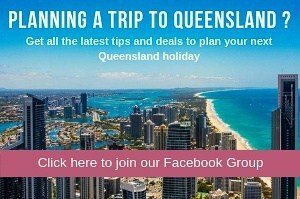 It is a free tour, with the exception of any expenses incurred during the day – i.e. 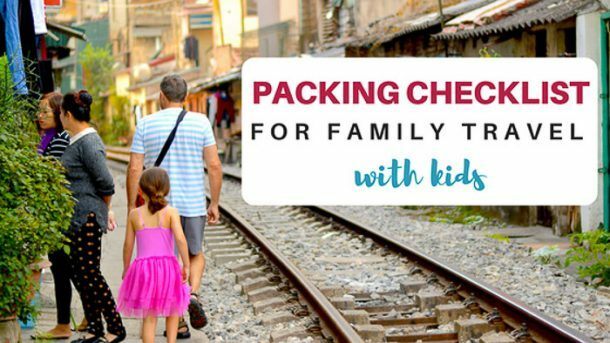 transport, entrance fees, food and drinks. 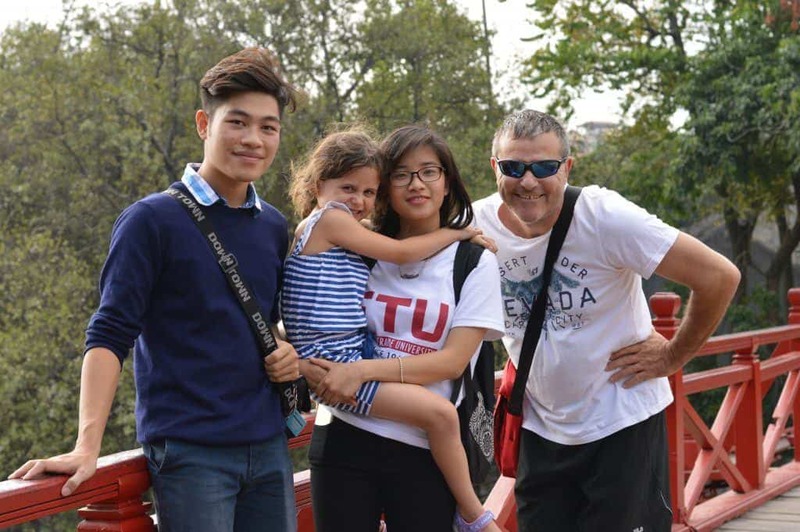 The concept of the tours is that they are run by local university students who are trying to improve their English, so they feel they are getting just as much out of the tour as you are by practicing their English with you. We had two guides for the day Trang and Huy. Huy had done 38 previous HanoiKids tours, whilst this was Trang’s first tour. I was so impressed by these two-young people. Their English was superb! They both advised me that they learnt a little English at school but mostly they learn English by themselves by watching American TV and movies. 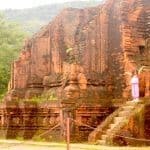 Our tour started at 9am and Huy and Trang where promptly waiting for us. 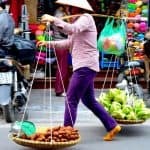 Click here If you’re interested in teaching English in Hanoi. Our first stop for the way was the Hoa Lo Prison Museum. We all jumped into a taxi which cost 32,000 Dong (approx. $2 AUD). The entrance fees was 30,000 per adult (approx.. $2 AUD) and Myla was free. Most of the original prison has gone and the land it was once on contains a modern office building. Only a small part of the original jail remains and now houses a museum so visitors can walk through some of the old jail cells. 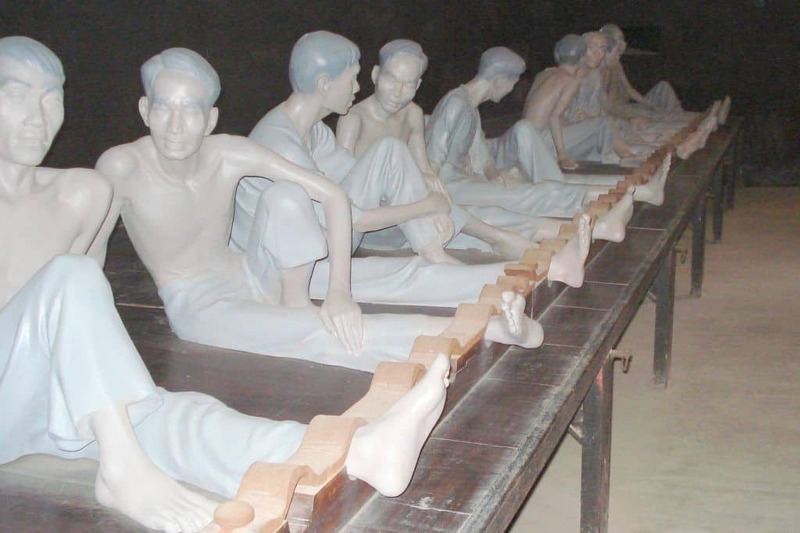 Nicknamed the Hanoi Hilton by American POWs, the museum has life size dummies to demonstrate what life was like in the prison. There are many displays with texts going into great detail about the torturous and barbaric treatment endured. 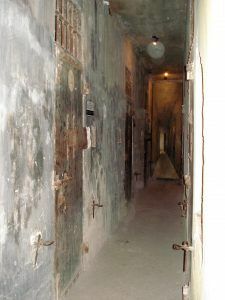 I visited this prison in 2007 and found it absolutely fascinating. Perhaps because I was not travelling with a 5-year-old then I could read the various displays in depth. However, this visit I did not enjoy it. Myla was terrified of the displays with life size dummy prisoners. 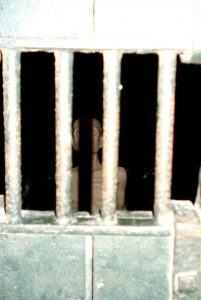 The museum is quite dark and still resembles and old prison, so this probably did not help. In the end, I had to take her outside whilst Andy quickly walked through. So my advice unless you have children that are not afraid of this sort of thing and happy to let you wander and really appreciate each exhibit – I wouldn’t go there. Huy and Trang suggested that Myla might enjoy the Museum of Ethnology better so we set off there. The taxi ride cost 100,000 Dong (Approx. $6 AUD). The entrance fee for the museum was 40,000 Dong (approx.. $2.40 AUD). Kids under 6 are free. 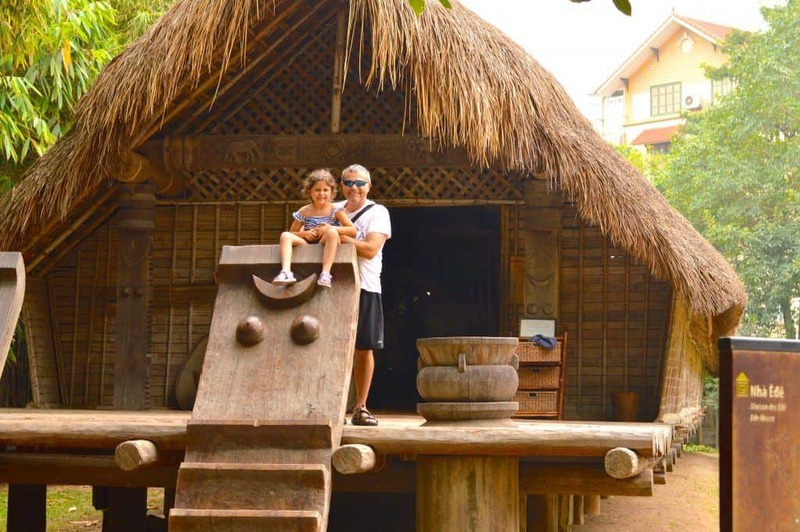 We all really enjoyed the museum of Ethnology and Huy and Trang were right – Myla absolutely loved it. 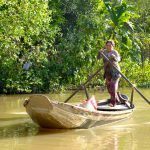 The Museum of Ethnology details the 54 officially recognised ethnic minority groups in Vietnam and has full scale replicas of traditional village houses. All displays are labelled well in English so you can a great opportunity to understand more about the traditional ways of the Vietnamese people. Huy and Trang had an impressive understanding of the various displays. Trang accompanied Myla around the Museum explaining each display in a way that Myla could understand, whilst Huy showed us around. If you’re looking for a great place for the younger kids to explore, I highly recommend the Museum of Ethnology. Interested in taking the kids to the Water Puppets? Click here for more details. We returned to the Old Quarter (via a taxi ride – 100,000 dong (approx. $6 AUD) and asked Huy and Trang to suggest somewhere for lunch. They asked “western food or local food” that was easy – local food!! We followed Huy and Trang through a tiny little alleyway, which resembled nothing like a restaurant. 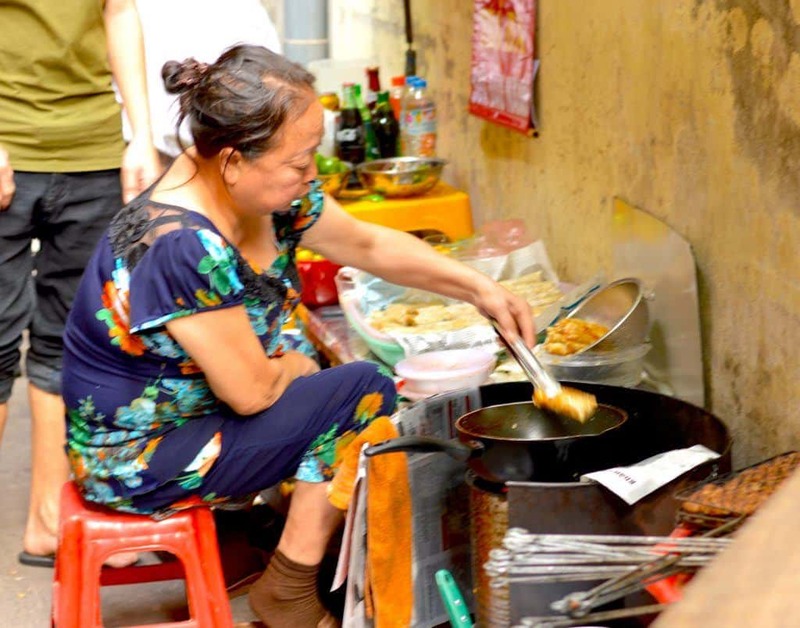 The alleyway would not have been more than 1.5m wide but it contained a small kitchen where a lady was cooking the food and locals were lined up on tiny childlike chairs eating bowls of what looked like delicious food. At the end of the alleyway, a tiny restaurant existed with the usual tables and chairs you’d expect in a restaurant. Many of the local restaurants only serve one meal, so its important to know what they serve before sitting down. Once you sit down, a few minutes pass and your lunch is brought to you without having to order anything – what’s there to order when thy only make one thing! We had a delicious lunch of pork balls in a broth in which we added noodles, various lettuce leaves and herbs with a bit of chili and garlic – absolutely delicious! Great for Myla too because she just ate the noodles and lettuce. Apart from the delicious food, what is more amazing about eating at these local places is the cost. For the 5 of us the total food bill was 165,000 Dong (approx. $10 AUD) we paid an extra 65,000 Dong (approx. $4 AUD) for 4 drinks. Seriously 14 aussie dollars for a delicious meal for 5 people!!! Awesome!! 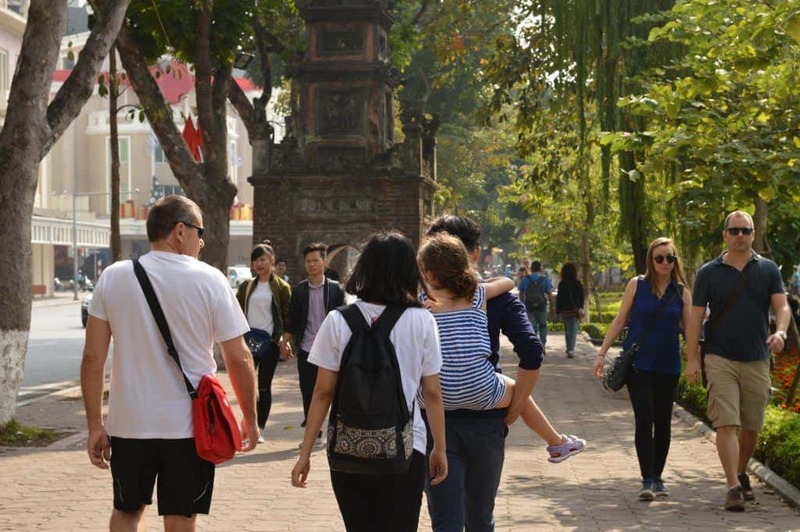 After lunch we went for a walk around the well-known Hoan Kiem Lake, also called as Sword Lake. A walk around the lake takes approximately 30 minutes, and it is a nice way to see how the locals relax when they are not buzzing around the chaotic city streets. Perhaps one of the more well-known parts of the lake is Jade Island. This is an island in the centre of the lake and to get there you need to cross a small bright red bridge (the Huc Bridge). Jade Island houses an 18th century Buddhist temple. We did not go to the island but we did the tourist thing and took some lovely photos of the bridge. By this time Myla had taken a massive liking to Trang and insisted on holding her hand at all times. She even had Huy giving her a piggy back ride. These guys were so great with her. Myla had been begging us to buy ice cream from one of the many stand around the lake and Huy and Trang suggested we venture into the French Quarter and get some ice cream. The French Quarter is nothing like the Old Quarter. The French Quarter resembles a modern city with wide open streets, high end hotels, restaurants and shops. For me it lacked the character that I so loved about the Old Quarter, it was not unlike a usual city street in Brisbane. Anyway, we got some delicious ice cream. I love ice cream at the best of times, but the Vietnamese ice cream is amazing! For 5 ice creams it cost 40,000 Dong (approx.. $2.40) bargain!!!! Can’t even buy one for that price at home!. After we finished our walk around the lake Huy and Trang took us back to our hotel and said good bye. Myla was devastated in saying good bye. I guess that’s the one sad thing about travelling – you do meet so many great people, but the reality is there is a huge chance you will never see these people again. Myla cried, had some photos taken with them and gave them big hugs. I loved our day with Huy and Trang from HanoiKids Tour. Apart from the great places they took us to, it was an opportunity to learn more about the lives of the local people. 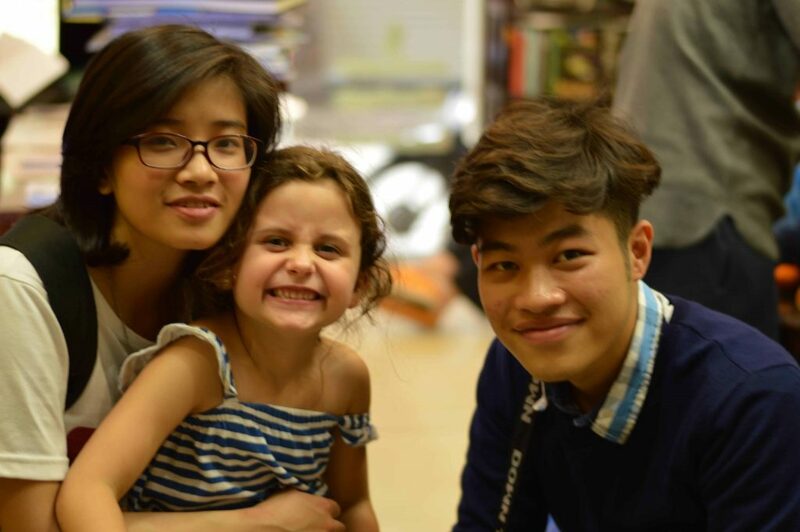 We asked Huy and Trang lots of questions about their lives and learned so much. 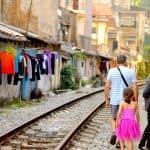 Huy and Trang were so great with Myla, so I highly recommend spending a day with HanoiKids Tour when visiting Hanoi. Just book in advance as these guys book out quickly as they are so popular! 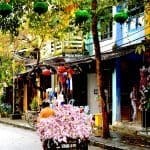 For more about Hanoi, check out our full itinerary in Hanoi. 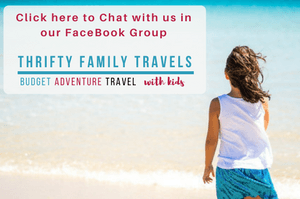 Have you spent the day with HanoiKids? Where did you go? Let me know in the comments below. We also absolutely loved our day with HanoiKids! Our girlies were little (6mo & 2yrs) so we didn’t do as much as you guys, but it was an amazing experience. 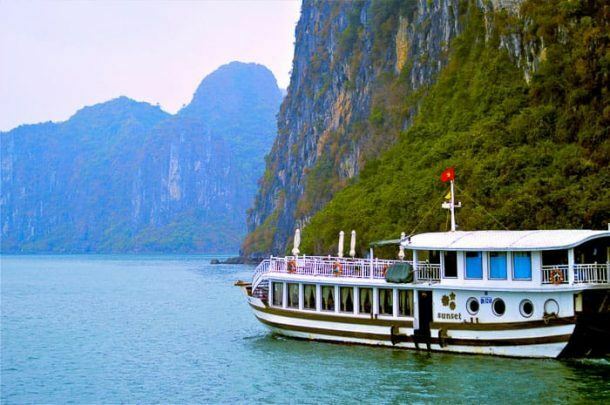 It will definitely be on our must-do list the next time we’re in Hanoi! HanoiKids are so great hey! !